The following group types are not accepted by this hostel: Junior / Primary School, High / Secondary School, College / University, Stag/Hen/Bachelor Party, Sports Group, Cultural Group If you have misrepresented the type of group you are booking for, your booking may be cancelled by the hostel." The Farm goes above and beyond the standard in hosteling. When it comes to living requirements we have it all, solid bedding with larger more comfortable mattresses, curtains on each bed for privacy and an international power outlet and reading light for when you just want to be alone. All our rooms are air-conditioned and have an ensuite with traditional open air shower. We have one of the top internet providers in Bali with fibre optic WiFi from anywhere on the property. We have scooter for hire, clothes lines and board racks, yoga matts and bean bags, come see everything is taken care of. Very nice hostel. Modern and clean. Most of the people stay in the hostel the whole day, just chilling by the pool and going out at the evening with other hostel people. Nice atmosphere to meet new people and to relax! Bestes Hostel in dem wir je geschlafen haben. Alles perfekt ! 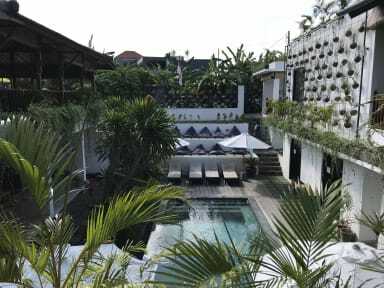 This is by far the best hostel in Canggu and I had the best time ever here. The staff is beyond amazing, the hostel looks more like a fancy hostel, the rooms are spacious and the beds are very comfortable. The farm has a lot to offer including BBQs and the best coffee in Canggu. I met a bunch of new people here and will definitely come back! Die Zimmer waren sehr sauber, bis auf die Badvorleger, leider waren diese auch nach dem putzen dreckig. Das Farm Personal war sehr nett und kommunikativ. Die Atmosphäre war sehr entspannt und cool gemacht. Leider war das Essen für ein Hostel zu teuer. Super Hostel aber eher für Party/Urlauber anstatt für Backpacker. Viele dort waren mit ihrem Koffer da. Ich habe das Hostel genossen da es super sauber und wunderschön war um mich zwei Tage auszukurieren aber ich hatte das Gefühl dort ist es eher wichtig gut auszusehen als cool drauf zu sein. Aber da kann das Hostel nichts für !! Das Hostel ist echt super gut. Top Hostel, wenn man einfach nur ne gute Zeit haben will und feiern möchte. All about hooking up and looking good. Not a real hostel atmosphere. Only about drinking and in the next morning no one would great each other. Would not come again. The staff is really nice tho.